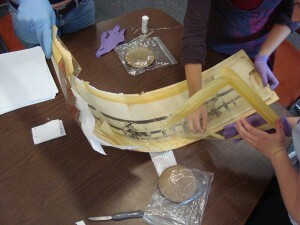 This piece is part one in a series of posts about Smithsonian Institution Archives’ (SIA) paper conservator and interns working on stabilizing a 1921 panoramic photo of air mail pilots and crews that is being moved to the National Air and Space Museum’s (NASM) Steven F. Udvar-Hazy Center. You can see Part II here. In addition to being the Paper Conservator for the Smithsonian Institution Archive’s own collections, I run the Smithsonian Center for Archives Conservation, serving our many archival units throughout the Institution. As a part of my work, I receive various requests for help. For example, this object, a panoramic portrait photograph of air mail pilots, crews, and their planes, is just one of some twenty-five items prioritized for immediate stabilizing intervention by my colleague Jordan Ferraro of the National Air and Space Museum Archives (NASM), before their collections move to their companion facility located near Dulles Airport—the Steven F. Udvar-Hazy Center. 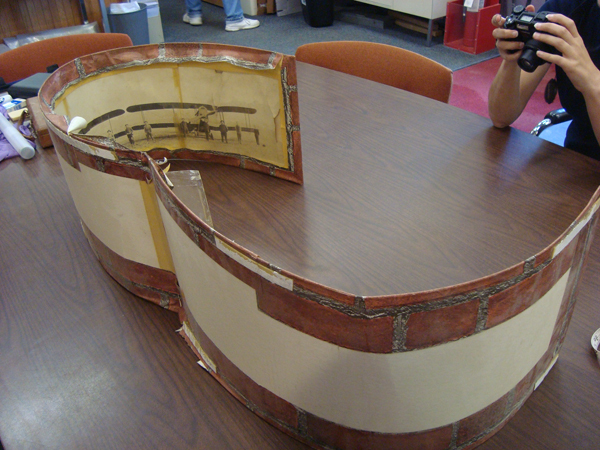 Because the object was so big and unwieldy, I thought it would make a perfect training exercise for both Jordan (NASM Archives’ collection manager) and two of our summer interns to work side-by-side with me. 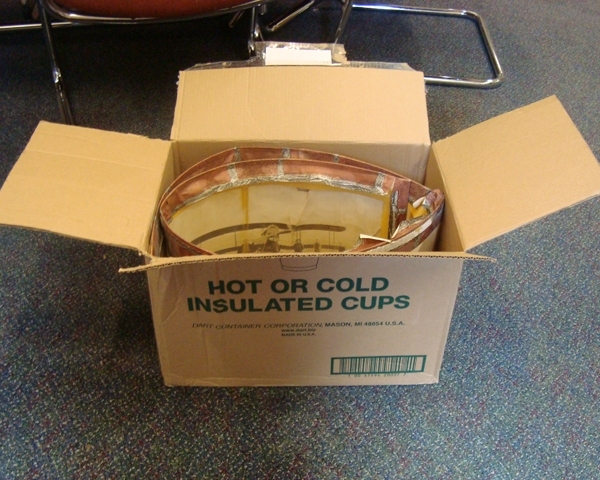 The object was received from the donor loosely curled in a cardboard box, and in a rather unusual frame. Due to long-term storage in that box, the framed photo and backing retain a significant amount of distortion or curl that made the object hard to examine, store, and safely move. The photograph was loosely enclosed over mat or poster board, with an overlay of an unknown transparent plastic, and sealed at the edges with an overwrap of self-adhesive vinyl brick-face wallpaper (aka contact paper). Wow—this was a little scary, because pressure-sensitive adhesives can release a lot of oxidizing and oily compounds that can stain and deteriorate the photograph, and can remain tacky over time. 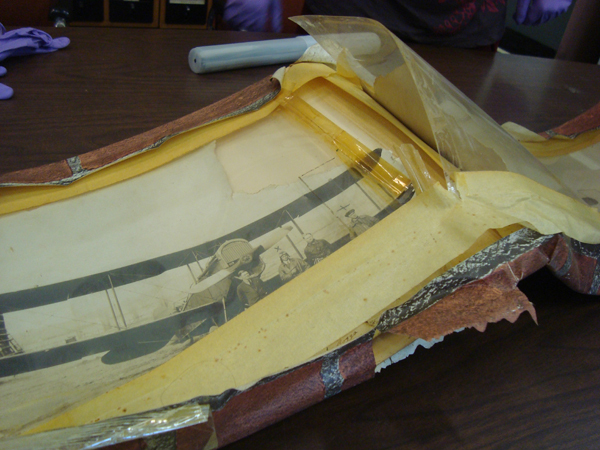 If the picture had slid into and gotten stuck to the exposed adhesive of the vinyl tape, we would be looking at a painstakingly involved treatment rather than a simple rehousing. We were lucky in that the photo was not actually stuck to any tape although it had gotten quite close. 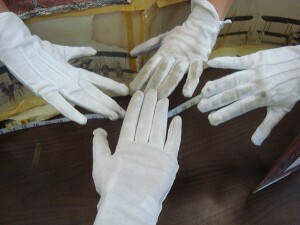 In addition, the outside of the package was very soiled; we wanted to prevent that from getting on the photograph’s surface, so we gently wiped both front and back surfaces using our famous white cotton gloves before laying the object on the clean work surface. We also took care to note and document anything would be significantly changed by our intervention, such as the grease penciled outline and x’s over the figures on the surface of the plastic covering material. Who did that and what do the marks signify? We don’t know, but it might be a clue that someone else could recognize in the future. Extreme caution was taken to slit and remove tape while limiting the exposure of sticky undersides, and getting them away from the object as far and quickly as possible. Once the tape was slit, because the backing was joined of two pieces and the object was in two main fragments due to a tear in the middle, we were able to work on the two halves separately for both efficiency and safety. Close teamwork was needed to position the curled object so that we were working on the flat, rather than up in the air. In just a couple of hours, we were able to free the object and safely rehouse it, making for a very satisfying preservation intervention. The interns’ perspective will follow in this blog, part 2, and see also Jordan Ferraro’s companion blog feature!